Leo Babauta wrote about the power of writing daily, sharing what he’s learned from about five years of daily writing. It got me curious about how consistently I write. Since I schedule my blog posts, my blogging history doesn’t give me useful data. Fortunately, I can get that data from my time-tracking. Here’s a graph showing how much time I spent writing between January 2012 and April 2013, with the greenest areas for days of about 4 hours of writing. 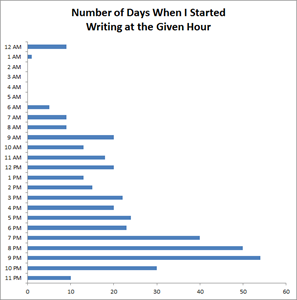 In total, I spent 346 hours writing, for an average of 0.7 hours per day or 5 hours a week. I wrote during 254 out of 486 days (58% of the days), or roughly every other day. My longest streak of non-writing was 8 days of not writing (September 2012, when I was on a trip with my family). My longest streak of continuous writing was 12 days of writing every day (June 2012). I usually start writing between 7 PM to 9 PM (after dinner), but I also write at other times. With the more flexible schedule I get to have these days, I go on a writing sprint whenever I want to. 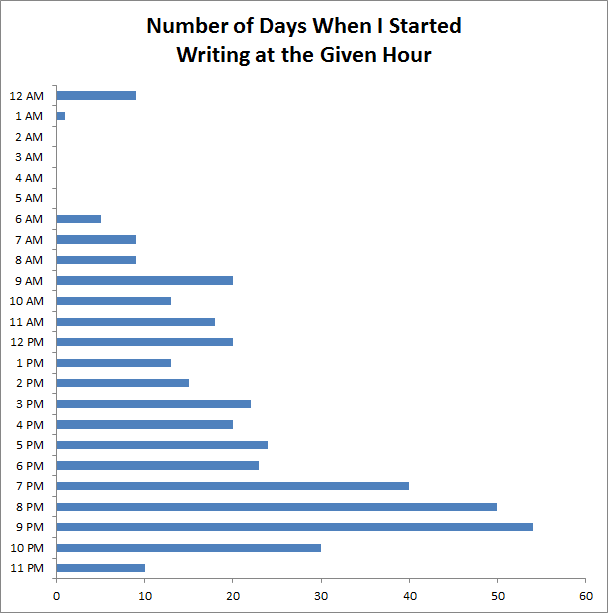 One of these days, I should put together a graph that takes into account how long I spend writing, too. It turns out that I write a lot, although it doesn’t feel that way looking at it one day at a time. In 2012, I wrote around 133,000 words for my blog. This is slightly more than the number of words in Jane Austen’s Pride and Prejudice, but nowhere near as awesome. I clocked 268 hours for writing during that year, so that works out to a really low 8 words per minute. I already know that the bottleneck is my brain, not my typing speed, though. =) The time includes writing non-blog stuff as well as discarded posts, but hey, it still gives me a good general idea. “Writing helps you reflect on your life and changes you’re making.” I do this a lot with my blog – looking backward to review decisions, looking forward to explore the possibilities. Not only is writing a good excuse to ask yourself these questions, but having a record of your reflections, reasons, assumptions, and predictions also helps you make better choices. “Writing clarifies your thinking.” It’s easy to fool yourself into thinking you understand something if it’s just inside your head. Once you try to explain it to other people, though, you’ll quickly find gaps. Writing is one of my ways of thinking out loud. My thoughts are fuzzy and elusive until I sit down and write a blog post, a note, a list, or draw a mindmap or a sketchnote. I figured that it’s okay to be wrong in public from time to time, and it’s better than never knowing about mistakes. “Writing regularly makes you better at writing.” I suspect that rewriting is an even more useful technique for better writing. I don’t do as much rewriting and editing as I probably should, although I often revisit and write about old topics based on new questions or ideas. That said, writing is great for practising organizing your thoughts and figuring out how to communicate them, and regular blogging is a great way to experiment with different techniques. “Writing for an audience (even if the audience is just one person) helps you to think from the perspective of the audience.” I like writing for myself, and I also like writing for other people. It’s fun to answer questions or to build on other people’s thoughts. “Writing persuasively — to convince others of your point of view — helps you to get better at persuading people to change their minds.” I’ve mostly given up on persuading people to change their minds, having read quite a few argument/rhetoric/persuasion books that made a lot of sense to me. Now I go for the low-hanging fruit of sharing tips and ideas for people who’ve already decided, and helping illuminate the possibilities for the people who are on the fence. =) Still, practice in examining and organizing my thoughts helps a lot when it comes to making better decisions or helping other people with theirs. “Writing daily forces you to come up with new ideas regularly, and so that forces you to solve the very important problem of where to get ideas.” Since I write about whatever I’m learning about, writing encourages me to keep learning. I don’t promise a particular set of topics, though, so I don’t feel that pressure to keep coming up with good material. Besides, there’s so much to learn and share! Writing is well worth the time for me. I wonder what would happen if I doubled the time I spent on writing, maybe splitting the extra time between research and editing… Hmm. Is writing worth it for you, too? What’s your experience like? How would you increase its benefits?